This fall, the New Museum launches a new lecture series, Outside the Box, a roster of gallery-based talks given by a variety of guest speakers over the course of a season. 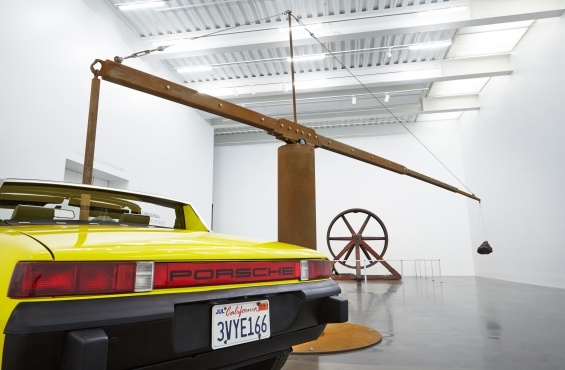 In this new series, lecturers with diverse backgrounds and affinities will address the New Museum’s current exhibition(s), kicking off with “Chris Burden: Extreme Measures,” in forty-five to sixty minute presentations taking place exclusively in the Museum’s galleries. As a way to emphasize the Museum’s strong commitment to new art and new ideas, Outside the Box talks are open to the public and are intended to provide participants with multidisciplinary perspectives on New Museum exhibitions. To this end, lecturers will speak about the exhibitions or themes emergent in artists’ works from the various positions they occupy, be they academic, personal, political, etc., and engage in rich investigations that illuminate and probe the Museum’s current exhibition program. All Outside the Box talks are free with Museum admission, but attendance is limited. Please RSVP here for more information and to request tickets. Andrea Callard is a collage maker working in film, video, and sound as well as photography, installation, and drawing. Her early work looked at nature in the city; ideas about landscape and how we live in a landscape continue to be a central preoccupation. Eva Franch is a licensed architect, researcher, curator, teacher, and founder of OOAA (office of architectural affairs). Prior to joining Storefront for Art and Architecture in 2010, Franch was an artist in residence at Schloss Solitude in Stuttgart, and directed the Masters thesis studio at Rice University while practicing and building in Catalonia. She studied at Delft University of Technology and earned an MArch from the Barcelona School of Architecture and an MArch II from Princeton University. She has lectured internationally on art, architecture, and the importance of alternative practices in the construction and understanding of public life. At Storefront, her most recent projects include a new publication series, exhibitions such as “No Shame: Storefront for Sale” and “POP: Protocols, Obsessions, Positions,” the launching of the Storefront International Series, the launching of the World Wide Storefront, commissioning major design projects such as the Speechbuster, and developing projects like the Competition of Competitions. More recently, with the project Office US, presented by Storefront, Franch has been selected by the State Department, jointly with a curatorial and design team, to represent the US at the 2014 Venice Architecture Biennale. Jenny Jaskey is curator of the Artist’s Institute at Hunter College, New York. Recent exhibitions include the works of Lucy McKenzie at the Artist’s Institute (2013–14), “The End(s) of the Library” with Julieta Aranda, Fia Backström, R. Lyon, David Horvitz, Christian Philipp Müller, and “The Serving Library” at the Goethe-Institut New York (2012–13), the works of Haim Steinbach at the Artist’s Institute (2012), and “Jutta Koether: Mad Garland” at Center for Curatorial Studies, Bard College (2012). She is coeditor with Christoph Cox and Suhail Malik of Realism Materialism Art, an upcoming publication on the “speculative turn” in philosophy and aesthetics published by Sternberg Press. As an artist, Andrew Lampert regularly uses moving images, live performance, and recorded sound to address the contemporary condition of cinema spectatorship in its waning days. He is concerned with time as experienced on screen, in the course of production, and most especially by the audience in a theater. He has exhibited at venues including the Whitney Museum of American Art, MoMA P.S.1, the Getty Museum, the British Film Institute, the New York Film Festival, and is distributed by Electronic Arts Intermix (EAI). Lampert is also Curator of Collections at Anthology Film Archives, where he is responsible for the daily management, photochemical preservation, and digitization of the moving image and audio collections, as well as co-programming the quarterly screening schedule. He has preserved more than two hundred movies by artists including Wallace Berman, Robert Breer, Bruce Conner, Tony Conrad, Manuel De Landa, the Kuchar Brothers, Marie Menken, Carolee Schneemann, Paul Sharits, Stuart Sherman, Michael Snow, and many others. Lampert teaches in the Film Department at Purchase College, and is currently editing a book titled The George Kuchar Reader to be published by Primary Information.